Grimaldi Baez cultivates spaces of radical imagination and conviviality around the city. 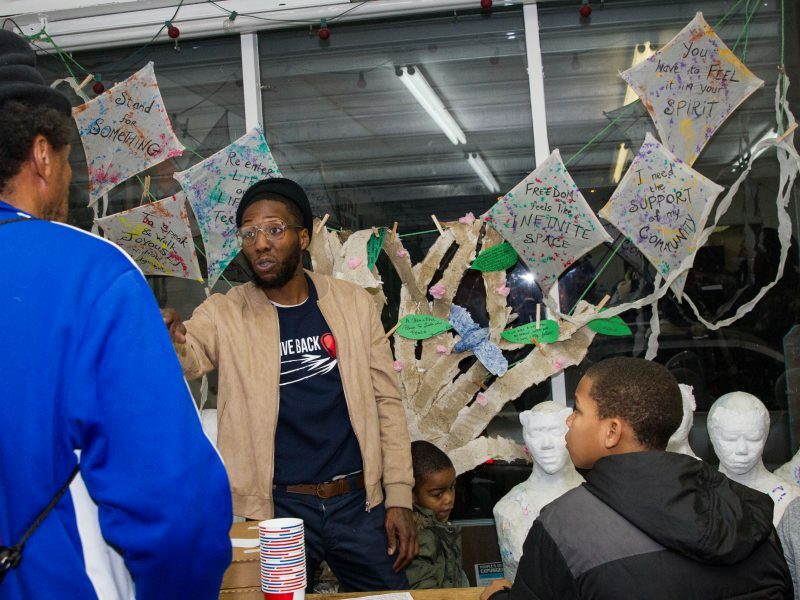 Reggie Johnson is a youth and community organizer, party promoter and father in North Philadelphia. How do and can we use existing resources around us as tools to meet our needs? 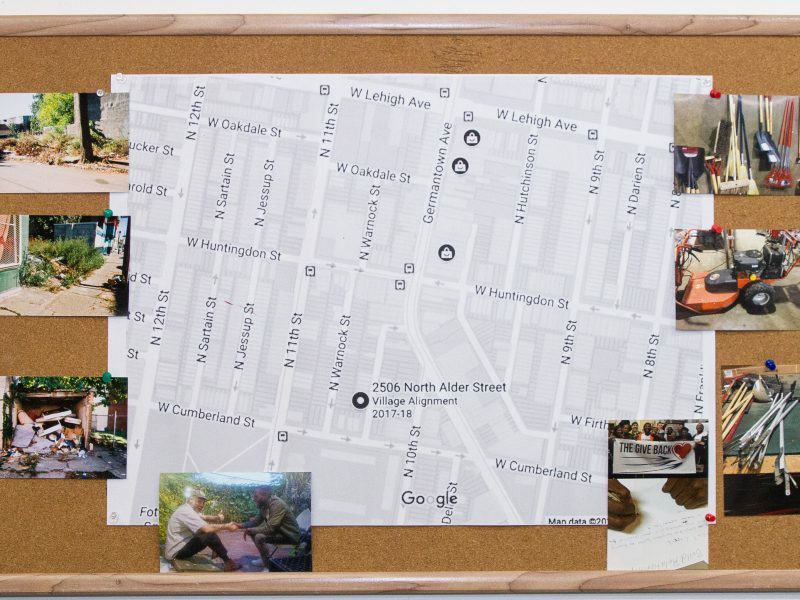 The artist residency project and the house functioned as a “system zero” — a space to observe and imagine how neighbors use and create systems to meet their common needs. 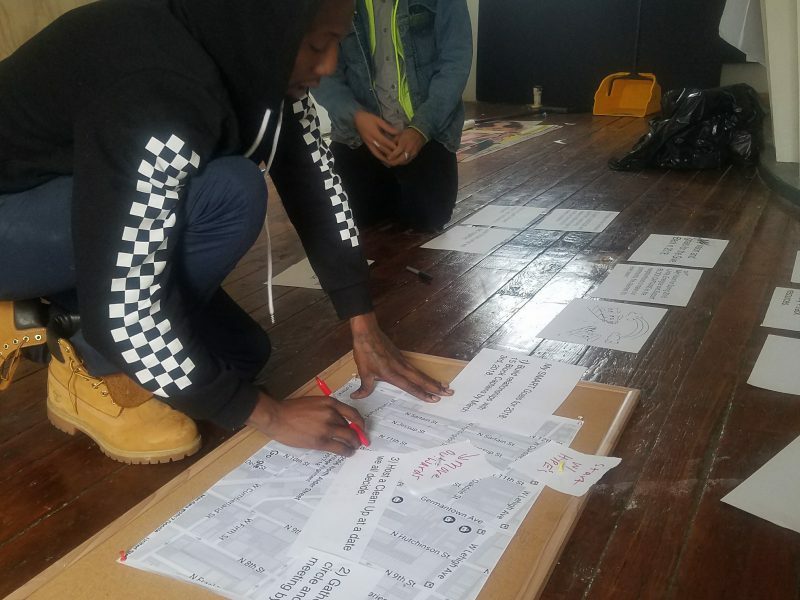 The goal of the residency was to creatively emerge tools and systems that could continuously meet the needs of the neighborhood artists and our community. Grimaldi sought to ensure that he and the neighborhood artists only built tools and systems that they really needed, wanted, fully understood and could use after the end of the residency. Ideally, he wanted the open nature of the project to reveal even more collaborators, needs, and solutions in the neighborhood. 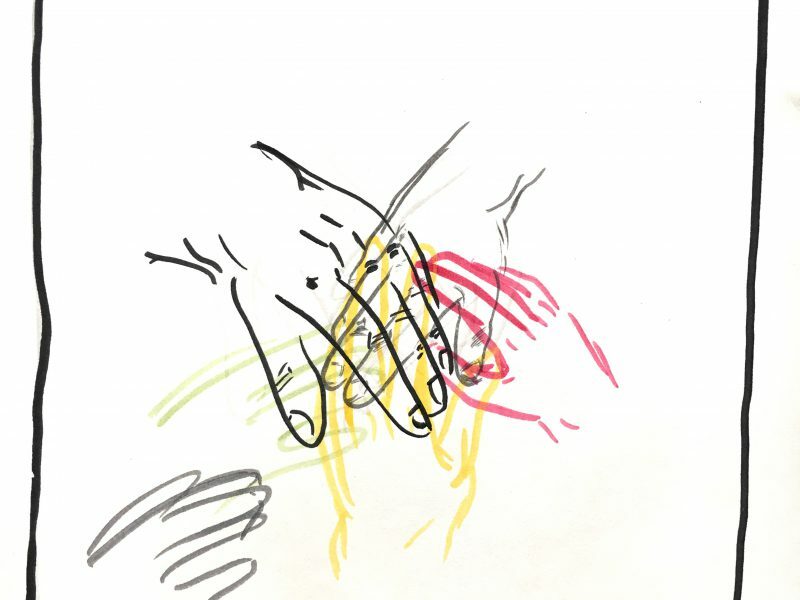 To this end, Grimaldi consciously pursued an “emergent strategy” approach to his project — centering the energy of and relationships between his collaborators, rather than a set end goal. As a result, the residency evolved multiple times in unexpected ways, and, when a new collaborator emerged, was extended to follow the project through to completion. These evolutions can be divided into two major phases, The Workshop and The Giveback, with the second emerging from the conditions of the first. 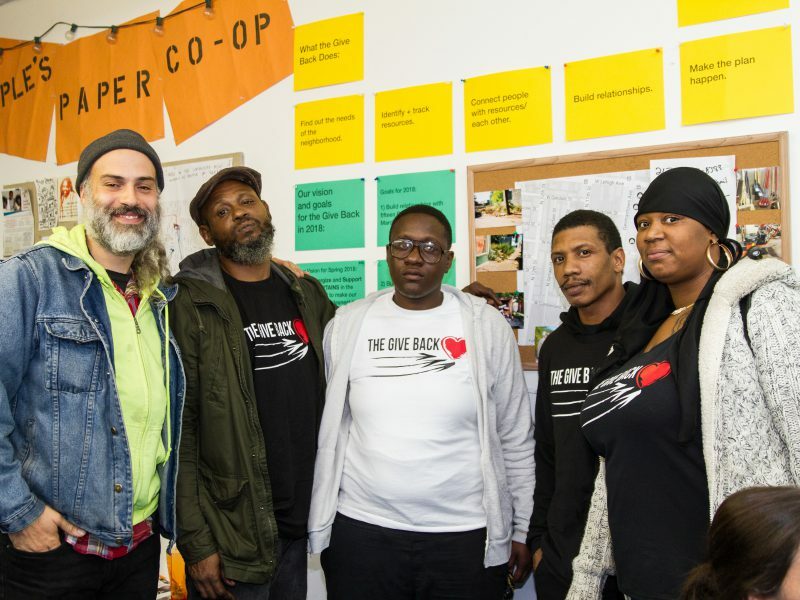 In The Workshop, Grimaldi and his original group of neighborhood artists, Stan, Ant, and Will, researched tools at their disposal at The Village and found new ways to use them to meet their central need of dignified employment. You can read about The Workshop here. As this group came to the end of their planned time together, a new collaborator emerged. 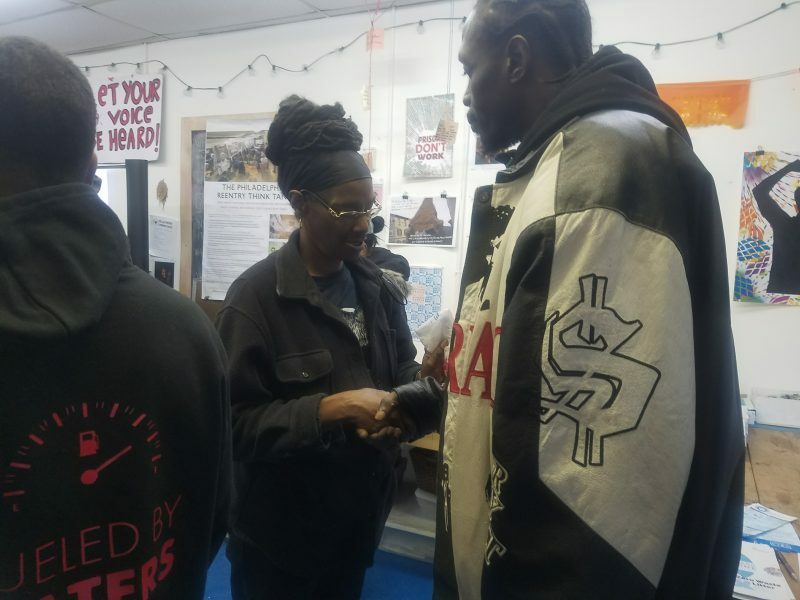 Reggie Johnson, a longtime Village student and community organizer, had been observing Grimaldi and the team. 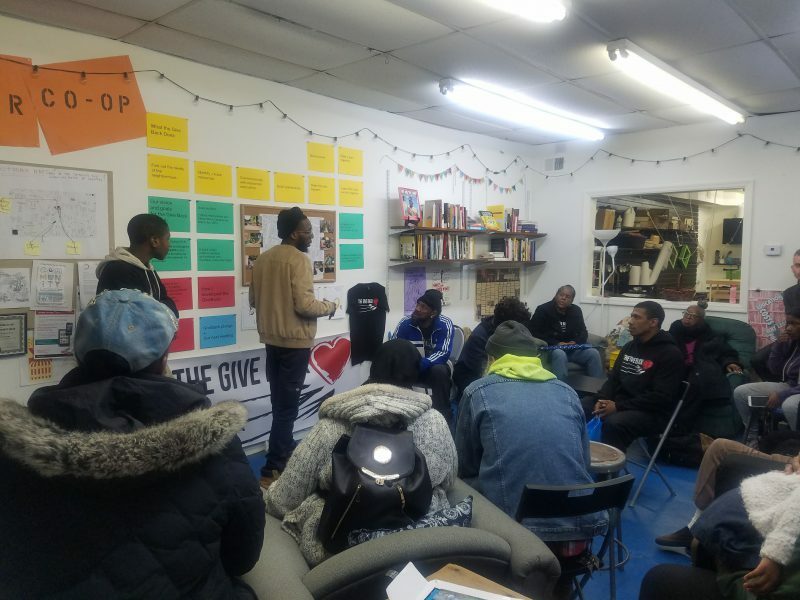 Through conversations with Grimaldi, Reggie saw resources — mentorship, materials, relationships — that he could use to increase his own impact as an organizer. 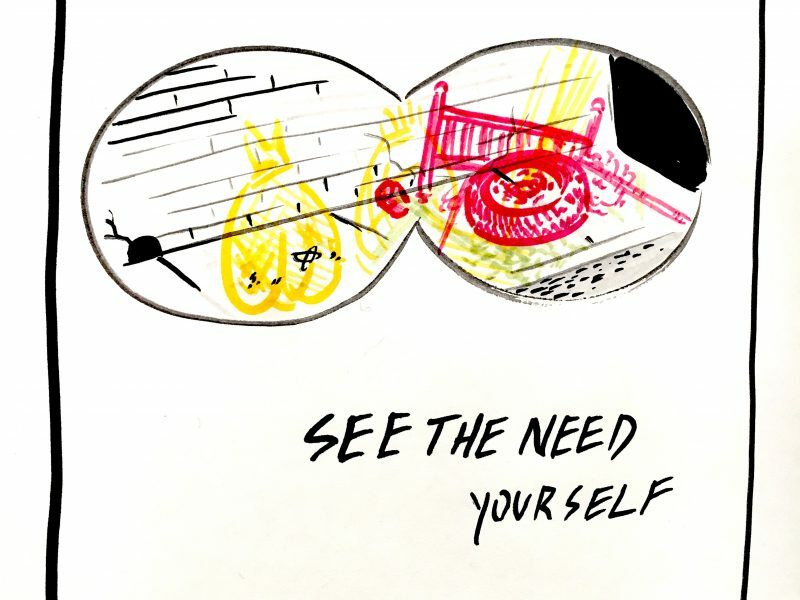 Reggie and Grimaldi undertook the same process, now refined through time, of identifying a shared concern (how to create a more connected and engaged community); naming Reggie’s existing “tools;” and adapting them to meet these needs. 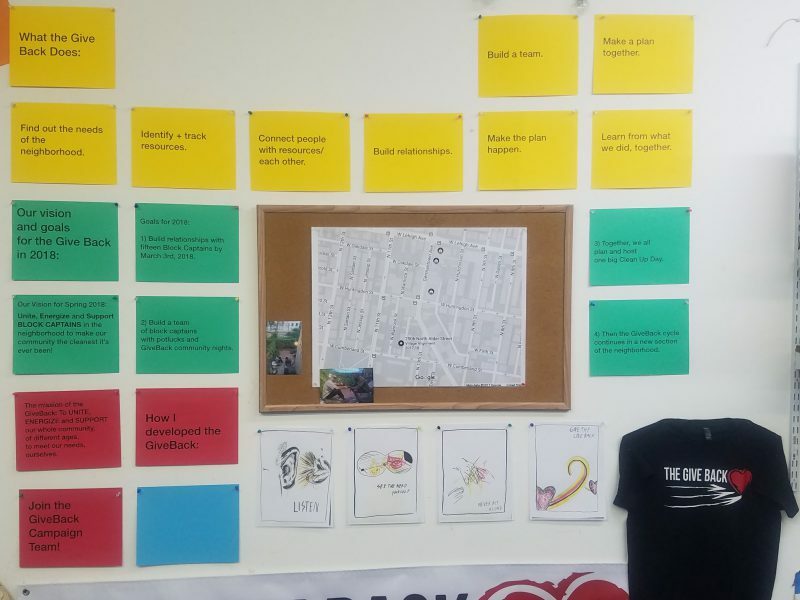 Through testing and adapting his “toolkit,” Reggie developed a campaign called The Giveback, strategically organizing neighbors to carry out a massive neighborhood-wide cleanup. Will, Stan and Ant all used the project as a springboard to employment opportunities around the city. 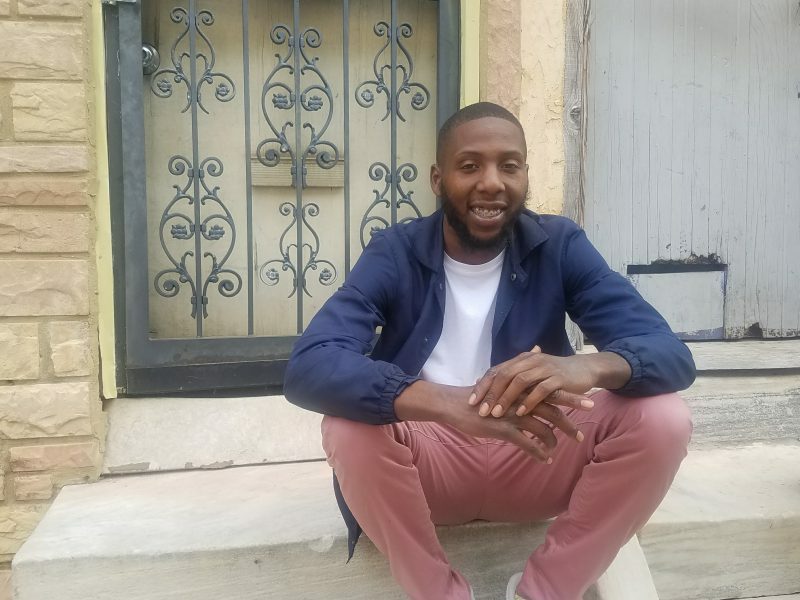 Reggie is currently employed by The Village as a community convener and organizer for an ongoing placemaking project at the basketball courts at 9th and Cumberland Streets. He is planning The Giveback cleanup for June 2018. Grimaldi and Reggie are completing the Giveback Toolkit, a short list of principles and “tools” to use for all community efforts. 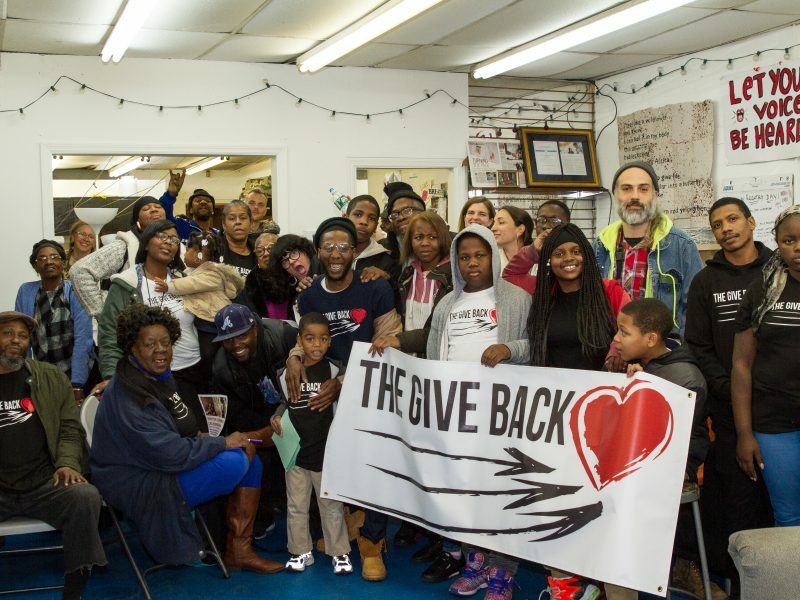 Reggie Johnson, Grimaldi Baez and community members gather to celebrate the launch of The Give Back Campaign. 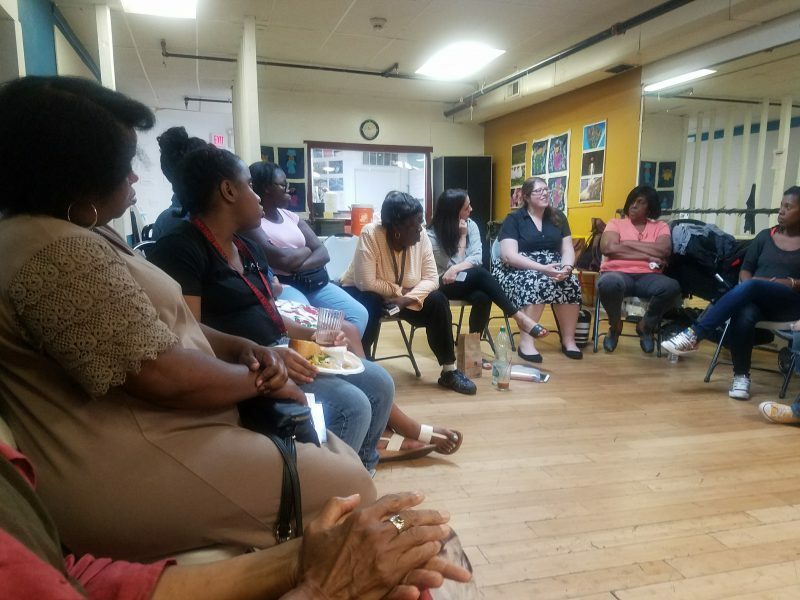 After months of working at The Village, a new collaborator emerged for Grimaldi: neighbor Reggie Johnson, with a community-wide need in mind. 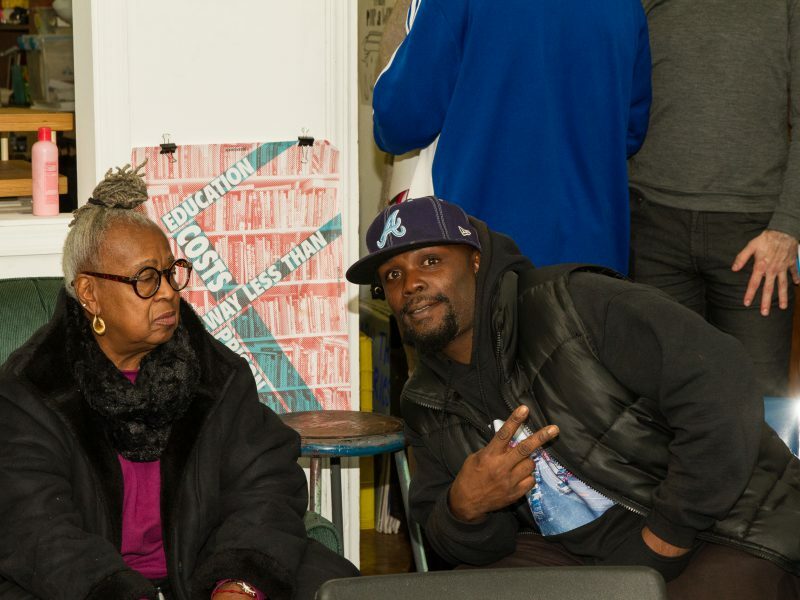 Reggie is a skilled and trusted convener in the neighborhood who, since a teenager, has helped to plan and run basketball leagues, dance crews, and throw and promote parties. Now Reggie is using his gifts to build the civic and political power of our community. 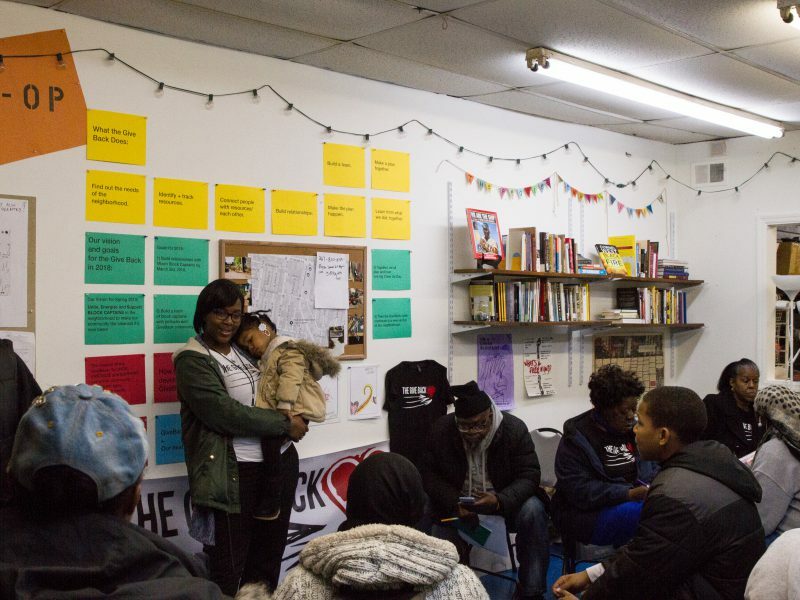 Together, Reggie and Grimaldi articulated a question: How can we build a more engaged and connected community, capable of meeting its own needs through civic and political power? The goal of this phase was to develop neighbors’ capacity to act, collectively, on their own behalf. One of Grimaldi’s overarching concerns was that his and The Village’s support did not undercut Reggie’s belief in his own power, but rather, helped Reggie solidify his own practice and networks as an independent activist in ways that would continue beyond the project. Reggie initiated each aspect of their work together based on his existing skill set. 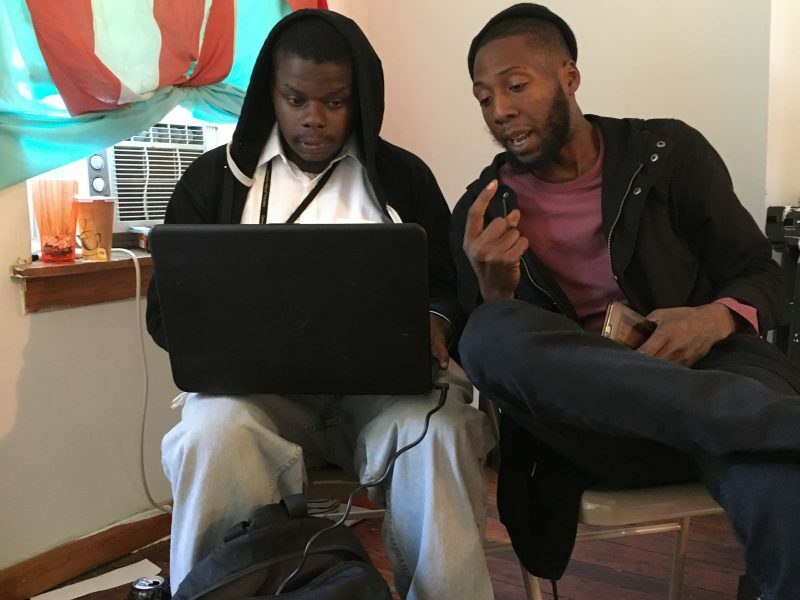 Grimaldi worked with Reggie to articulate his “tool kit,” practice and refine a simple methodology for using these tools in order, and ultimately, design The Give Back campaign — a tool for getting things done, together — for the spring of 2018, to further test and expand his abilities as an organizer and the community’s capacity to work together. 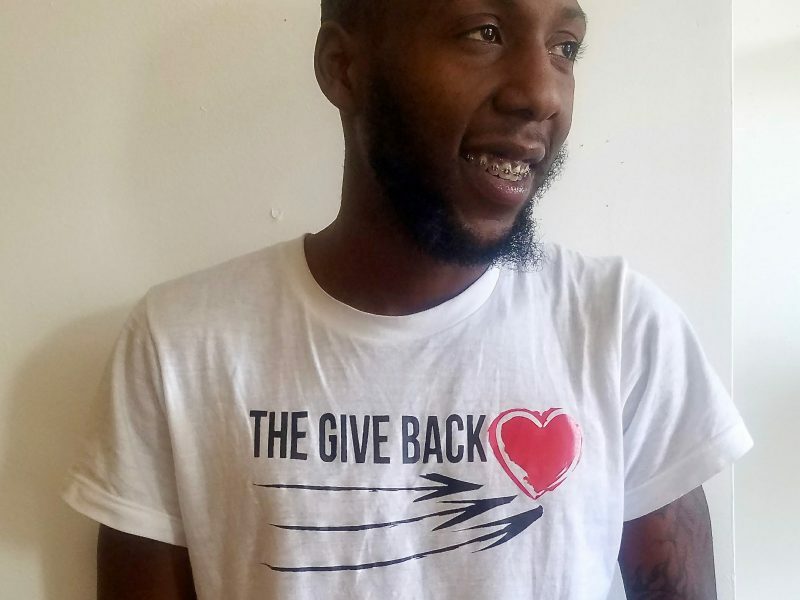 The story below shares the project’s journey, and the Give Back methodology, in Reggie’s own words. Need-finding Tool #1: Door-to-door survey. Reggie walked through the neighborhood to speak to neighbors one-on-one. Need-finding Tool #2: Story Circles. Reggie was trained in this structured, collective story-sharing methodology by Appalshop founder Dudley Cocke at The Village. Need-finding Tool #3: Photo documentation. On phone and film, Reggie captured photos of the neighborhoods most distressed lots. 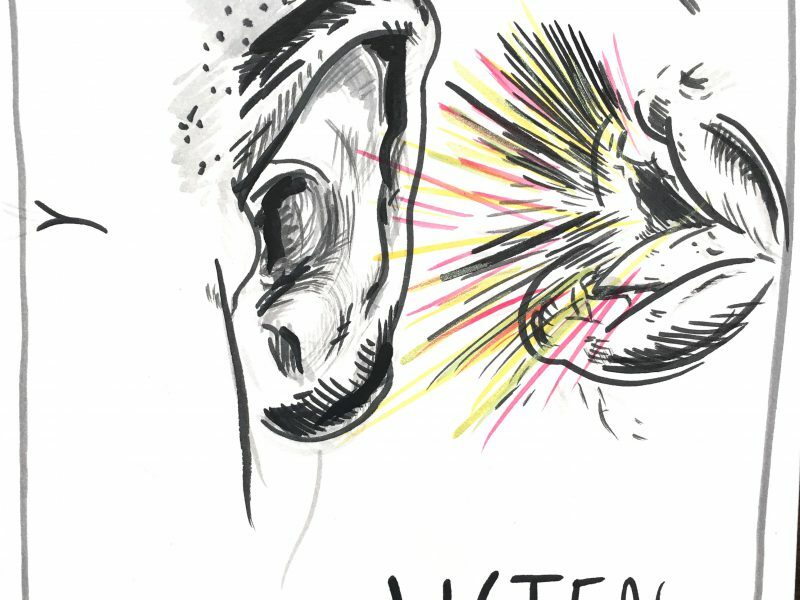 Need-finding Tool #4: Active listening. Reggie practiced listening more than talking, and asking open-ended follow-up questions, to get the nuances of the story. Give Back Principle #1: Listen. Illustrated by Grimaldi Baez. Give Back Principle #2: See The Need Yourself. Illustrated by Grimaldi Baez. “Before we started working, we decided we needed to see what people really want — what was their biggest worry. Grimaldi knew I’m connected with everybody around here. So he said, let’s go do what you to do, talk to people — and do a survey. So I showed him what I do. He saw me knock on people’s doors, and how people came up to me with a smile. Grimaldi made some suggestions about how to ask questions, and to take notes on my phone for later. 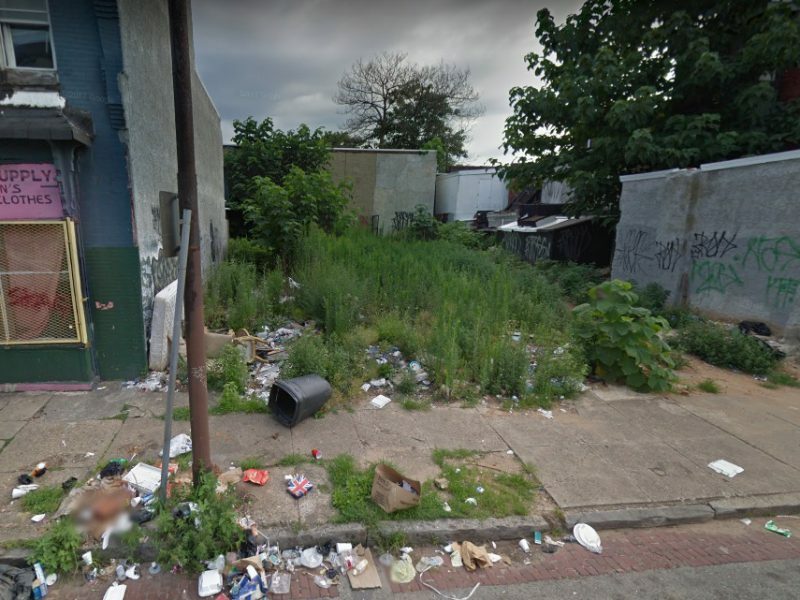 Once we surveyed the neighborhood, the biggest thing we heard was clean lots, clean blocks. That was the biggest thing. Resource-Finding Tool #1: Relationships. Reggie met with Village staff to learn about resources. 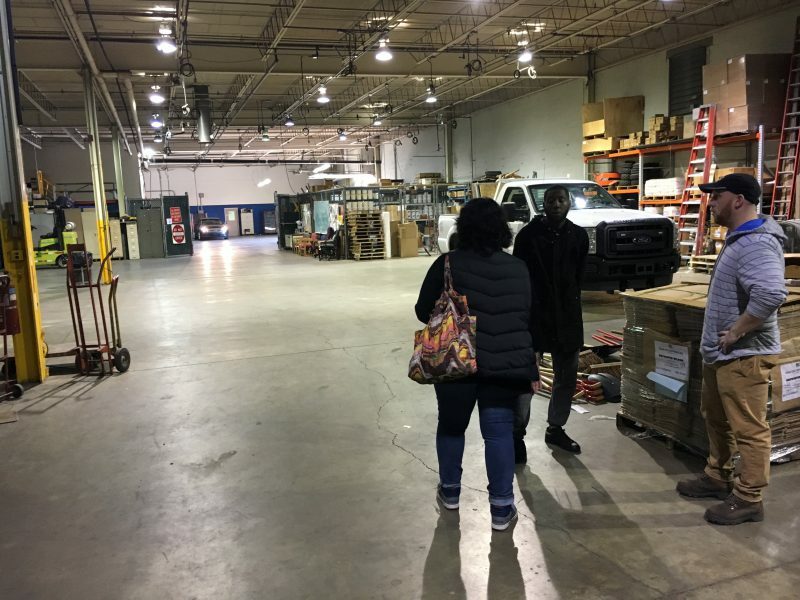 Here he visits a City supply depot with Community Economic Development Director Marangeli Mejía-Rabell. Resource-Tracking Tool #2: Mapping. Reggie marked neighborhood organizations and community members offering resources. Resource-Tracking Tool #3: Fliers and guides! 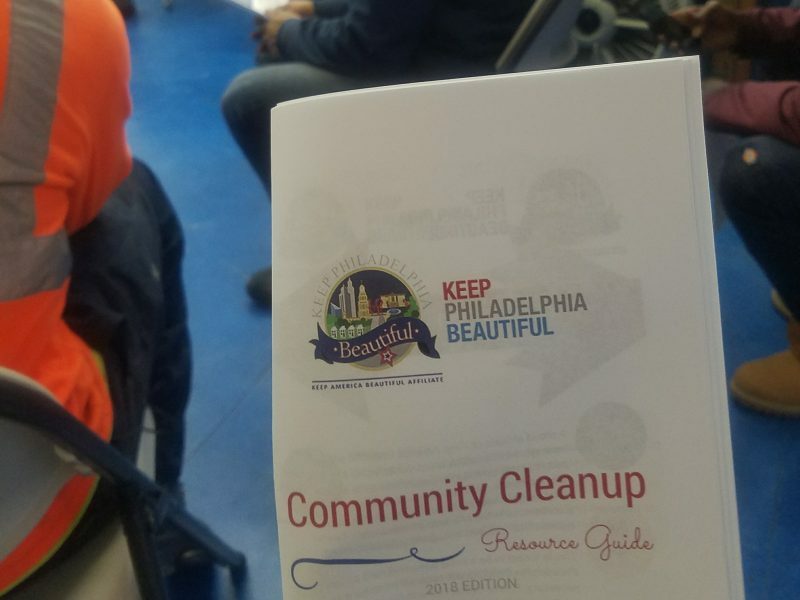 Keep Philadelphia Beautiful prepared this guide just for the Give Back and its audience. “Hype wanted action. But the lot he wanted to clean was really dirty, old beds, big trees. It was too much work for just us. We would have needed a dumpster and people to come pick it up. I also wanted this lot to remain clean when it becomes clean. I decided to help him figure out how to get the resources he needed for the long term. 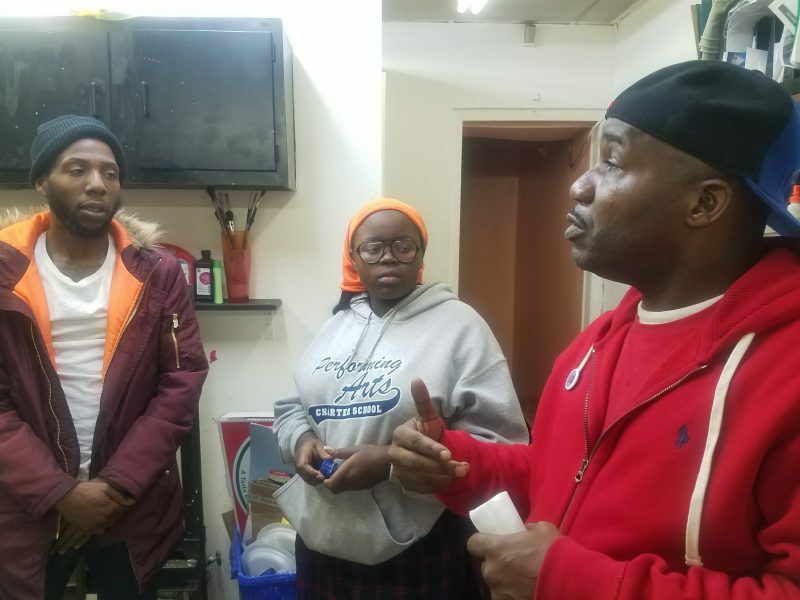 First, we asked [Village Community Economic Development Director] Maggie and [Village Corridor Cleaning Manager] Shaheed what we should do to do help Hype. Shaheed showed us how to call 311 and find out who owns the lot. Maggie showed us where the City’s cleaning supply warehouse was. We decided to go there in person to see for ourselves how it ran. I didn’t believe we could get all these supplies for free! I recorded these resources for later. All of this is the Give Back. Resource Connection Tool #1: Events! 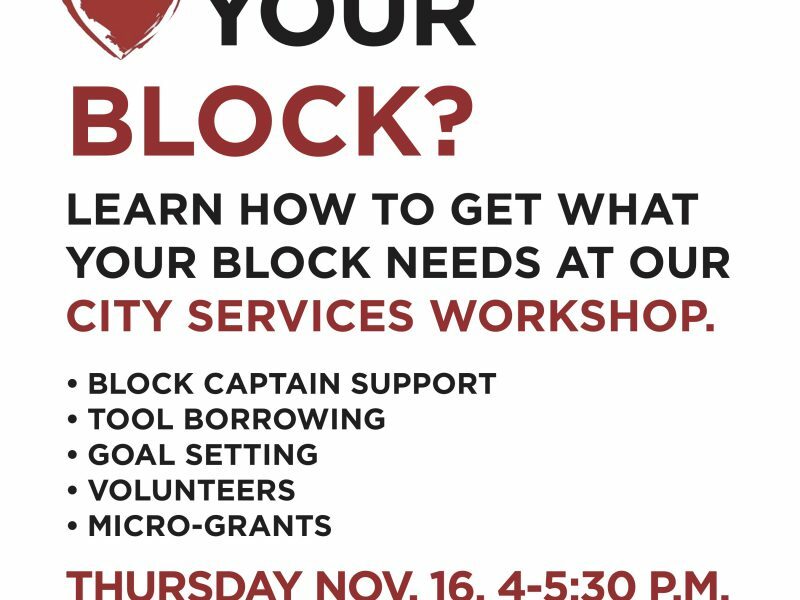 Reggie planned a workshop where residents could learn about available block-cleaning programs and resources. -- and a t-shirt, which Reggie handed out at the event. This was the soft launch of The Give Back. 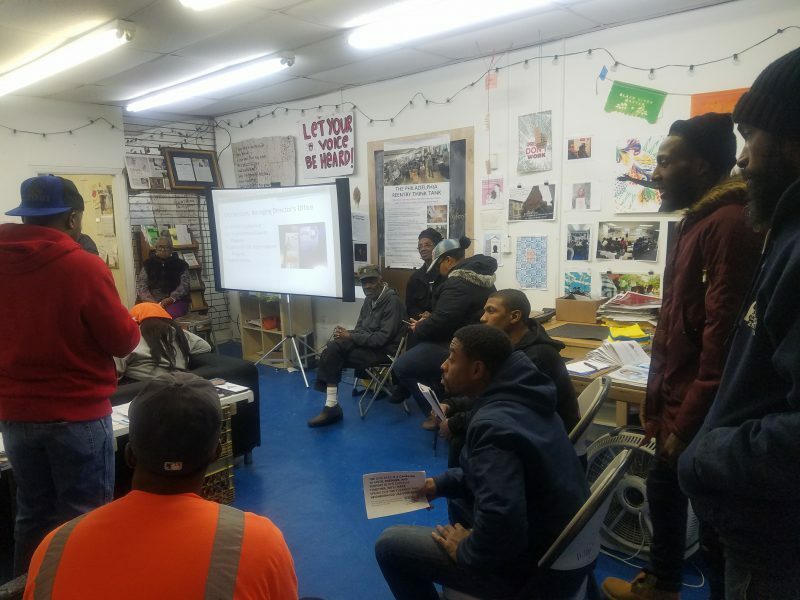 A packed house attended the Keep Philadelphia Beautiful workshop. Resource Connection Tool #3: Gather like-minded people. Reggie used the workshop to connect civic leaders, who in turn can share resources with each other. “NOW I went back to Hype, and I told him, this is a huge step! We don’t have to do this all by ourselves. And we have a meeting with Michelle to spread all the info. I have experience promoting events and getting people together. I got a logo made by my partner Wayne Mugga, who does my party promotion with me. I drew it out for him. 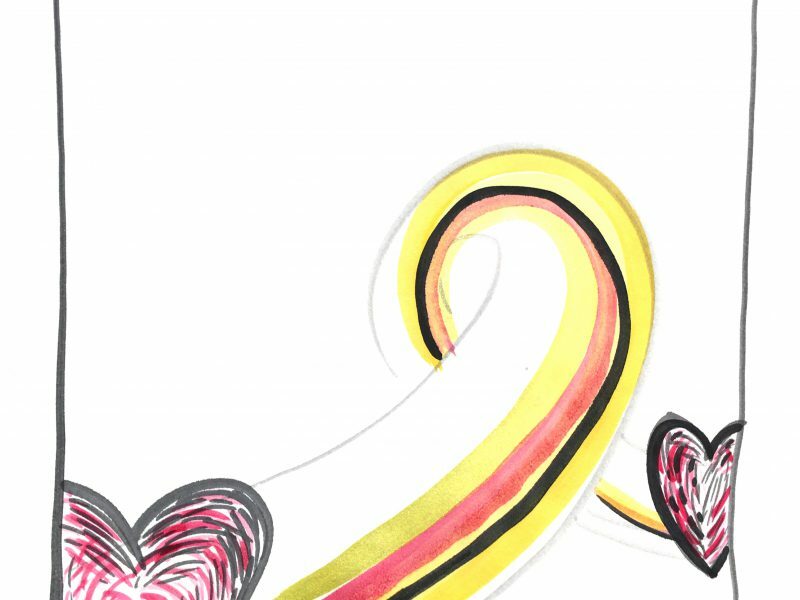 The Give Back is really about promoting love. I practice for myself, I walk around and I give you love first. Even the meanest people I give them love, trying to fix love in their hearts. When I got the fliers, I started inviting people I wanted to know about that resource. I took the flier to them, and explained it to them. I see the ones that clean up a lot, I even went to the drunks that clean the avenue, the store owners that clean the avenue. Not just neighbors, all kinds. That’s what makes it easy for me. I narrowed down a category and that’s the people I invited, as well as my closest colleagues. Aunt Diane, Aunt Eleanor. Reggie convened a sharing session about his ideas for The Give Back for his closest friends and supporters. 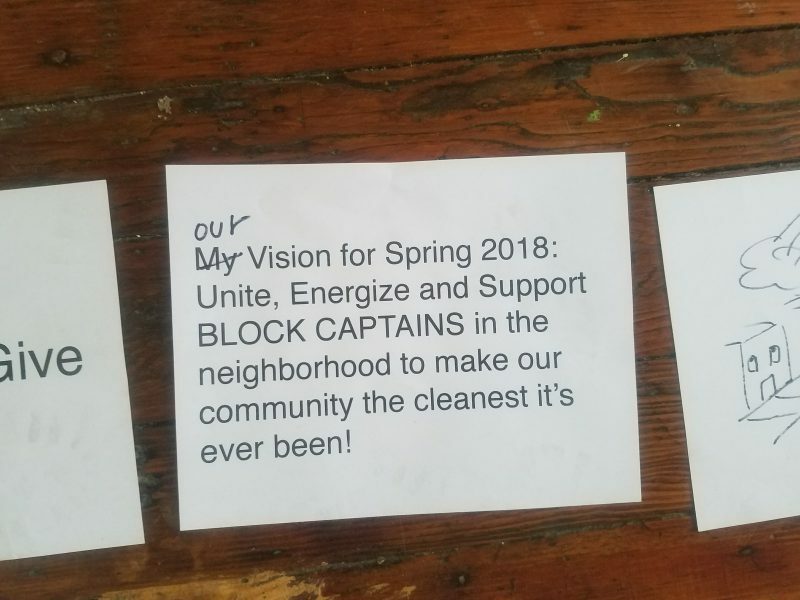 Reggie and Grimaldi put together everything they heard from neighbors into a plan: a campaign to support and activate block captains. Reggie edited the campaign for presentation multiple times. Reggie's supporters, young and old, came out to hear his ideas. Reggie uses listening, trust, space, and reflection time to build a team, and make a bold plan. Grimaldi, Hype, Brittany, Poppy, and Akeesha, 5 of The Give Back core team members. 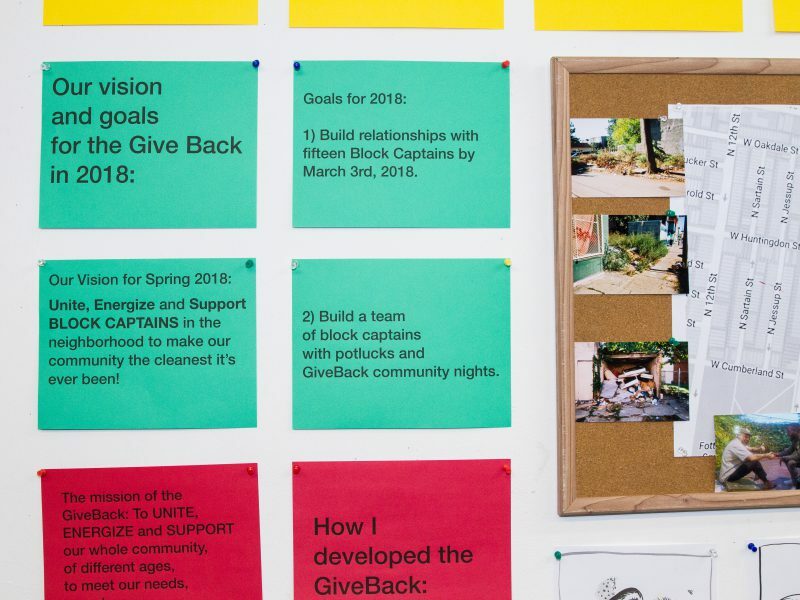 The Give Back plan focuses on a block captain campaign in 2018. Give Back Principle 4: Give Back The Love.